Why is it that less than 25 % of pet owners ask their vet for help with their pet's anxiety or fear, yet when asked specific questions on their pet's behaviour, over 50% of our pets are affected? There is only one truth in the care and management of a pet (or any sentient being with a phobia) - that is that it is a behaviour that cannot be cured with a pill or that can be "snapped out of". 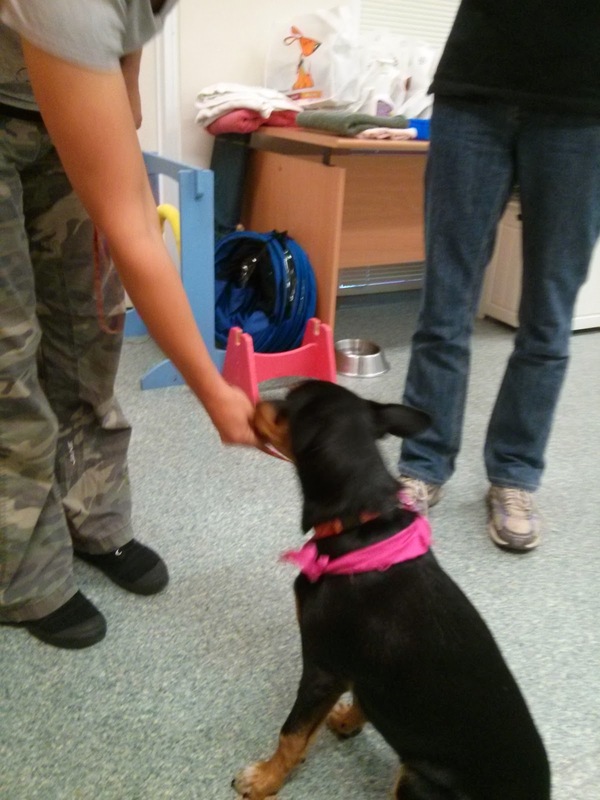 But... many pets can be helped if they are identified early enough, help sought and steps taken to help them. She was 10 weeks old when she joined our family. 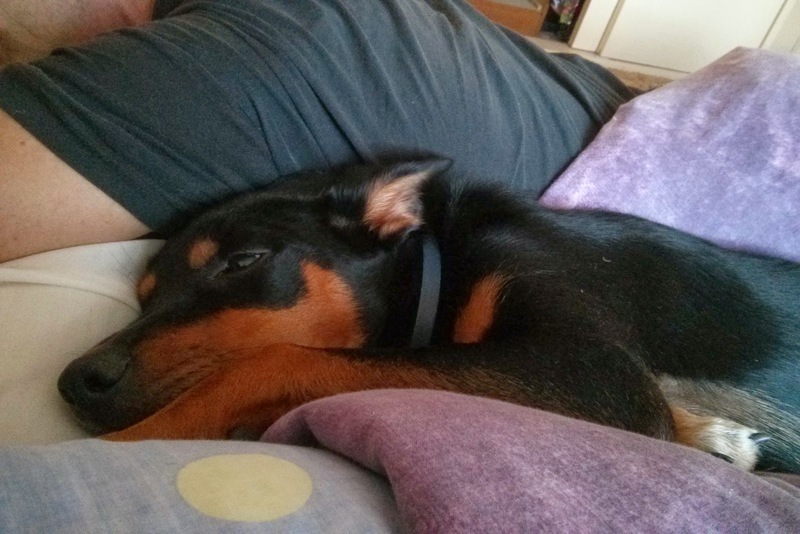 We adopted her from the RSPCA in Sydney. On the second night with us, we had a horrendous thunder and lightning storm. Poor Piper was frantic, and we had a very bad sleepless night. It had been a long time since we had a puppy, and I had never had one so scared like this one was. This is what Piper does now through a storm! Snoozing in her favourite place! Closing the curtains and isolating her to one room stopped her anxiety with the light flashes. Putting the TV on helped reduce the suddenness of the noise. It was still a sleepless, difficult night. We should have used alot more food and games during the storm, to help her form the association that "storms = fun stuff". Fortunately, we had several thunderstorm and noise CD's, which we played constantly throughout the house - starting at low volume, and then increasing the volume over the ensuing weeks. She wore an Adaptil collar, and we spent time having fun with the scary noise in the background. Piper is still anxious with new noises, but fortunately through her previous training, she has learnt to calm down very quickly. 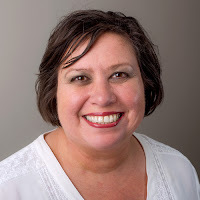 "Coping with Noise" strategies falls into " Immediate "(i.e a scary event is happening now, and something needs to be done now) to " Long Term " (i.e we know we have a problem, what are our strategies to deal with it). - keep them inside or any place where you know they feel "safe and secure". It's like us being scared, but climbing into bed and putting the doona over our head. We are still scared, but feel a bit safer. 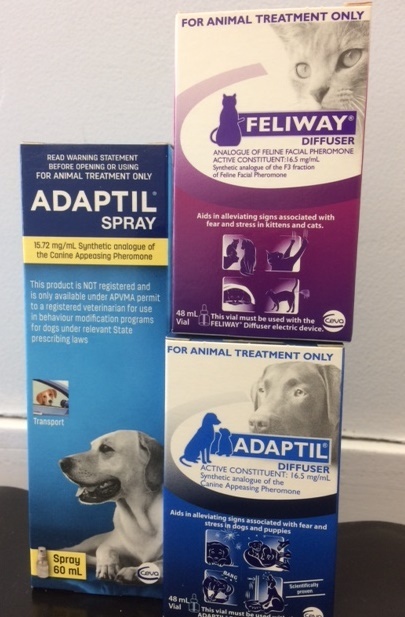 - Adaptil sprays, collars or Diffusers for Dogs or Feliway for cats - I am a big fan of pheromones in helping reduce arousal or anxiety in our dogs and cats. - Homeopet Anxiety medication - this does work in a fair percentage of anxious pets, and in some it isn't enough. - Vitamin B and Tryptophan supplements - Tryptophan is the precurser to the calming neurotransmitter Serotonin. 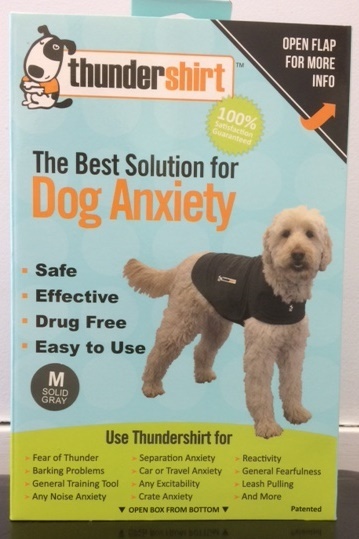 - Thundershirts are great for many dogs and cats. Available in many sizes. - White noise - There are radios which emit a noise which counteracts the frequencies of the thunderstorm/fireworks. - Background noise - such as a favourite TV show or radio. - Thick, high quality blackout curtains. - Training - a perfect time to distract with training games such as "Touch" or "Tug of War". Over the past 25 years, I have seen the progressive change in the types of medications used in our pets, ranging from medications that make a dog outwardly calm, but inwardly increases their sensitivity to noise (not a good thing) to medications that induce an outward and inward calm (ideal). 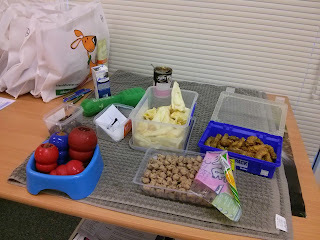 This is still a work in progress - currently, we are trialling two new medications for all dogs, so if you have had no success in the past, do not hesitate to call us on 42845988 or email me on russellvalevet@gmail.com to discuss what this may mean for you and your pet. We are always watching out for new medications and strategies to help our scared dogs and cats, so please do not give up if something hasn't worked in the past. Keep in touch with us by signing up to our Animail Tails. Click on the image below to find out more about anxieties, fears and phobias in dogs. I am Dr Liz, the mad vet from Bellambi. I have been a vet for over 26 years now, and during that time I have treated many pets with anxieties. We do stock and sell the medications, the supplements and external support items, with our personal successful experience of dealing with this with Piper and other pets, so do drop in to visit us. One thing I have learnt, is that I have had greater success if I see the pets early, with owners dedicated to trial different medications at different dose rates. I also have had tremendous failures, part due to me choosing the wrong medication for that pet, and part due to the owner unwilling to work with me to individualise their pet's management program. There are no quick fixes when it comes to mental health.